Space Needed: 3x3x4 Place on table top. Ahhhh! The smell of freshly made popcorn attracts people like nothing else. 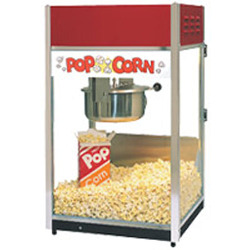 Whether you prefer the enticing smell or tasty flavor, a popcorn machine rental enhances every event and celebration. Machine only, we must add supplies. Features a 6 ounce kettle that makes six servings every 3-5 minutes. Attractive design is easily portable and sits on a table top. Includes a scoop and kernel tray. Available for delivery or customer pick up. Note: MUST USE COCONUT OIL or cleaning fee will be charged. Rent machine then add supplies like all-in-one packs and bags See Extras & Supplies. Uses 10.2 amps.